Lew Hollander raced his first-ever Ironman in 1985. The setting was Kona, Hawaii (site of the annual World Championship race), and he was 55 years old – no spring chicken, by most measures, for tackling such a grueling event. Fast-forward twenty-four years: it’s October 2009, and Hollander is back in Kona. But he’s not merely on vacation. Nor is he there as a spectator, reliving his glory days as an Ironman. 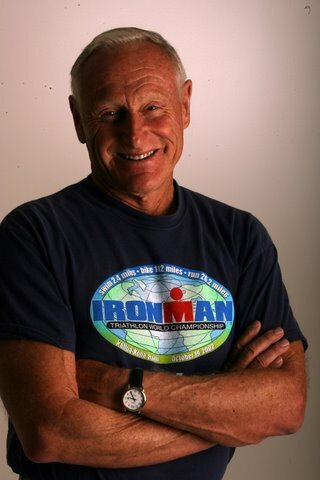 Rather, he is competing in his twentieth Ironman World Championship race, at the age of 79. Once again, he successfully completes the course within the seventeen-hour time limit. In fact, Hollander has “never not finished” a race he has started, and this includes, by his own estimation, a total of about fifty Ironman races, as well as an additional fifty or so marathons, among numerous other endurance events. I spoke with Lew just a couple of weeks before he was to compete in the St. Croix Ironman 70.3, a half-Ironman distance race in the Virgin Islands which offers qualifying slots for the Ironman World Championship in Hawaii. On May 2, 2010, Hollander finished St. Croix in 7:45:56 and, being the only person in his age group competing, naturally won himself a spot to race in Kona again on October 9, 2010 – this time as an octogenarian. What follows are some highlights of my interview with this remarkable man. How did you get started in triathlon? Were you athletic from a young age? I started out with – we did a lot of endurance riding, or long-distance horseback riding. My wife was interested in horses. We had Arabs. It’s a quite challenging sport. As you know, we’re in the [American Endurance Ride Conference] Hall of Fame, both of us. I won a lot of races, like probably 150. I’ve won 150. She’s won more. We used to clean house. Anyway, we got into this sport and…there’s a lot of strategy in it. And then I matured into…there’s another sport called Ride and Tie, where you have two runners and one horse…that’s the most exciting thing I’ve ever done with my pants on. Ride and Tie was just right, cause I could run and you have two runners and one horse. And you go maybe 50 miles, 40 miles, something like that. How are those [Ride and Tie] races structured? They say “go” and you can ride as far as you want, usually a mile or so. Whatever the two runners figure out they want to do. You could go fifty feet if you wanted. Then you switch. You keep switching and switching until you get to the finish line. It’s a tough race cause you’re sprinting all the time, and the horse is sprinting all the time. It takes a good horse to stay under two runners. You and I could kill any horse. Amazing how that’s the weak link in the team, usually. We had good horses so we were in demand and I got some really good partners. Anyway, it’s a lot of fun to have a Ride and Tie. So I started doing that. Then all the guys were doing this thing called ultrarunning. I didn’t know what the hell that was. They were running the Western States and things like that. I was there when – the first year Gordy went up there…he had his horse, and his horse was lame, so he ran. I rode with him actually, most of the way, on the Tevis Trail. We used to do that race all the time. I said it’s impossible to run all this way. It’s absolutely impossible, it’s impossible. I hadn’t even done a marathon, I don’t think… I was riding, and he was running, I said this is impossible, this is like this crazy thing…Then I started doing ultraruns and marathons, you know. Then I ran the Western States in ’84. So I said well, what do I do now? You ran the Western States? Were you able to complete that in 24 hours? Twenty-eight hours. That was okay, I did what I wanted to do. I ran 100 miles, that’s alright. I didn’t think the body – I didn’t think anybody could do that. I was amazed that I could do it. Not only that, but I could run the next day, too. It was just unbelievable that you can learn that your body actually has capabilities you just have no concept of. Were there any secrets you unlocked from doing that? No, I just kept going, one step after the other step, you know the story. So, I’d done American River, they use pretty much the same trail that they did originally for the endurance ride we had done. I ran a lot of ultras for awhile. What am I gonna do next? The Ironman sort of came along. I said, that looks pretty interesting. If I can run the Western States, that oughta be a piece of cake. Course I couldn’t swim or bike… So I sent in my entry, and I got in, 1985 was my first Ironman. They sort of let you in if you were somebody. They didn’t let everybody in. You could just send in an entry to Hawaii then. They were pretty selective, but I did the Western States, so I was in, you know. They let me do it. So I had to go down and get a bike. And then go ride with the bike guys. We were all sorta nuts anyway. The first time I rode with them, they all left me. I couldn’t figure it out. They came in and one of them said, “What happened Lew, ‘d you have a flat tire?” I was really pissed off at that. I didn’t like that at all. So I learned how to bike a little bit, I got a bike and I managed to struggle through it. What do you consider the highlights of your career as an endurance athlete? What do you consider to be your crowning achievement(s)? Well, I’m not done yet! I’m only 80 years old now, I gotta hope I have a future. You gotta keep the carrot dangled in front of the donkey. I don’t really, it’s not a crowning achievement or anything. It’s an evolution. Every day it’s just like getting through the Western States. It’s one step after another, you know, and you just keep going. And that’s what life is. One little barrier they keep throwin’…Somebody upstairs just keeps throwing these barriers in front of you, and you just keep hopping over them, and so far I’ve gotten over them. You didn’t at any point have any kind of grand plan other than the next immediate challenge? You didn’t project into the future any specific goals? Can you tell me about your training regimen? I’m curious to hear how it may have evolved over the decades that you’ve been racing Ironmans. How have you refined it, and were there any significant turning points for you? I haven’t refined it at all. The one problem that I have, with aging – you know, getting old? – I’ve found is that I no longer can train [the same way] for races…I can race, on race day I can do pretty well. I’m up for one day. But it takes me longer to recover. I don’t know why, and it ticks me off. I…actually train less and less, but my performances haven’t diminished a whole lot, so I guess I was overtraining before, which is not unheard of, you know. But no, I haven’t really learned anything about training that I’ve changed over the years. I don’t have any great plan in training. I go with the guys and you know, who’s going or who’s running today? Who’s riding today? You get a little group together. And we go and “Whatsa matter Lew, can’t you keep up anymore?” You know, “let’s go” and “okay” so we run and ride and swim. Was there a specific age you noticed it took longer to recover? How would you describe your diet, in a nutshell? Everything…everything, except tomatoes. I hate tomatoes. What are the secrets to longevity? Not just living a long time, but maintaining the highest possible quality of life as you get older? Eat plenty of amino acids, keep an active mind, and go anaerobic every day…I figure you get the first forty years free. You can do anything you want with yourself. After that, you gotta start taking care. Where do you turn for inspiration? Any heroes? Lew Hollander lives with his wife of forty-three years, Hanne, in Bend, Oregon. He is a physicist and the author of the books And Chocolate Shall Lead Us and Endurance Riding. His website is www.lewhollander.com. Tomorrow (June 6th, 2010) is Lew Hollander’s eightieth birthday. HAPPY BIRTHDAY, LEW!!! Thanks for the inspiration, and hope to catch you showing us young’uns a thing or two in this year’s Ironman World Championship! This entry was posted in Interviews, Triathlon and tagged aging, American Endurance Ride Conference, Ironman, Ironman World Championship, Lew Hollander, Ride and Tie, St. Croix Ironman 70.3, ultrarunning, Western States. Bookmark the permalink. I met Lew before the I.T.U. world champs at Fredericia ,Denmark 2001.I was setting up my bike as he was passing and he enquired about the national flag on my camper van,Wales .My wife gave him a brief history. At the time i had no idea who he was but i certainly did later.He has inspired me ever since and is out of the same mould as the late Andy Ripley.All the best for the future. Very inspiring story to live by.